More often than not, our modern lives are so hectic that looking after a little one with ‘sticky fingers’ leaves parents looking strained and frazzled at the end of the day. If you’re a parent looking to stay organised without burning a hole in your pocket, look no further. Tollyjoy’s latest collection of accessories are practical and trendy, with great quality for great value. Looking for that ultimate bag that can accommodate all your Baby’s needs in one trendy package? The polka-dotted Tollyjoy Nursery Bag carries everything you could need for a fun day’s outing. With a handy zippable inner pocket, you’ll never rummage around for that packet of disposable wipes or nursing pads again. Two elastic holders inside the bag keep bottles secure with no danger of spillage and the broad, adjustable strap allows you to carry the bag at your length of comfort. The strong yet lightweight material can be easily cleaned with a damp cloth, and the attractive red, orange, brown and lime-green colour scheme makes it an undeniably trendy bag for all occasions. Tollyjoy Baby Carrier keeps your hands free and ensures Baby is snug and safe. 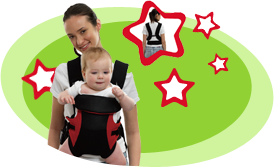 Available in black-red or black-khaki, the carriers are suitable for babies 3 months and above for a maximum weight of 10kg. Featuring Tollyjoy’s signature strong, durable and lightweight material, the carriers have wide padded contoured straps to distribute Baby’s weight evenly across Mommy’s shoulders and lumbar area. Flexible 3D mesh is incorporated into the carrier to dissipate heat and moisture, ensuring maximum comfort for both Mommy and Baby! For the active on-the-go nursing mothers, Tollyjoy Cooler Bag with refrigerant brick stores 4 milk bottles cold for up to 12 hours. With microfibre fabric on the exterior and insulating layers inside, this lightweight cooler bag is ready to go at any time – simply freeze the refrigerant brick before use! Ideal for keeping expressed breast milk cold throughout the day while you are at work or play when Baby is not with you. Whether you are a busy, modern Mom and Dad looking for the ultimate convenience in caring for Baby, or looking for great style and comfort at affordable prices, this Tollyjoy collection of accessories is for you.